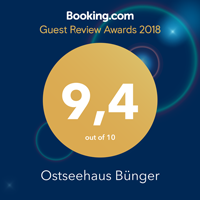 At Ostseehaus Bünger, good food and drink have the highest priority. As such, we are delighted to get your day off to a good healthy start. For a cosy private breakfast in your apartment or junior suite, we’ll provide a lovingly-filled breakfast basket with various rolls, jams and honey, regional cheese and cut meats. Should you decide otherwise, you are more than welcome to enjoy a wide variety of breakfast delicacies from the buffet in a fine hotel ambience just a few steps from your holiday abode. As culinary accompaniment on your excursions around the area, or for some stylish relaxation in your wicker beach chair, we would be delighted to prepare your own picnic basket for you – from hearty and rustic to select and exclusive. Just outside our complex, in Strande town, there are numerous superb restaurants, bistros, cafés and bars to choose from. Menus range from the finest maritime Baltic kitchen through regional specialties and homemade cake outlets.